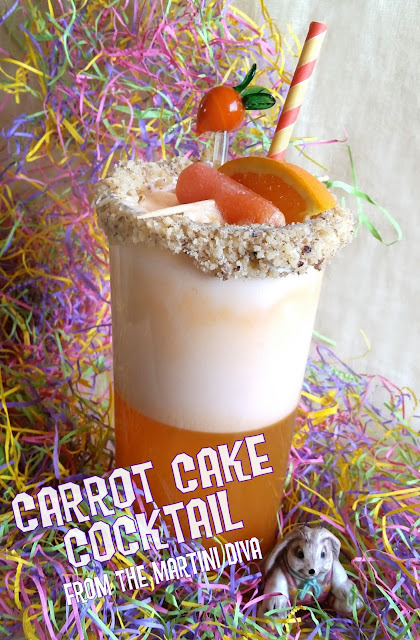 A few years ago I had some carrot juice and I decided to do a Carrot Cake Martini. I enjoyed it so much I decided it was time to take another whack at it again with some different ingredients. Why Carrot? First: I had a new juicer and a bunch of fresh organic carrots. 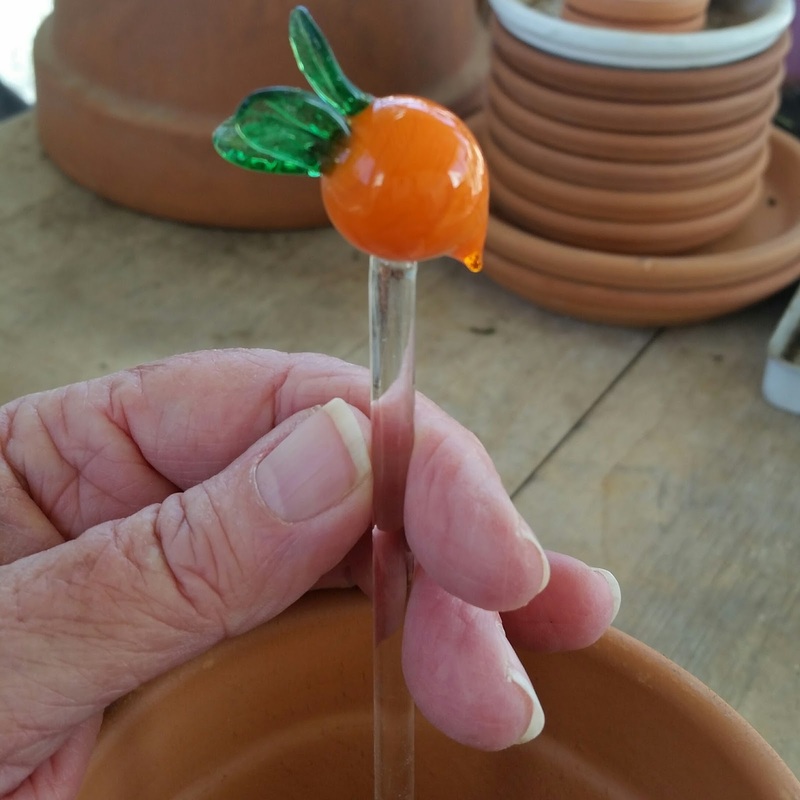 Also I was sent this totally adorable glass Carrot Swizzle Stick from The Swizzle Stick Shop (along with a whole box full of others!) and had to use it. Second: Carrots are healthy, sweet and taste good. Since Medieval times, carrots have been added to cakes to sweeten them and add moisture. Carrot cake became a popular recipe during World War II when sugar was being rationed. Also sometimes referred to as Passion Cake, carrot cake is now one of the most popular cakes, along with Red Velvet and Chocolate. Third: Carrots are high in fiber and beta-carotene but VERY high in sugar, which is why this drink is surprisingly sweet. The dark, spicy rum brings it's unique spices and adds the vanilla essence, the touch of Scrappy's Cardamom Bitters add an additional baker's spicy touch. Topping the whole cake experience off is the spiced honey sweetened cream cheese frosting rim with crushed walnuts and the orange slice and baby carrot for garnish. Don't Run Like A Rabbit! Don't wrinkle your little bunny nose at carrot juice in a cocktail and go hopping off in fear ... this is so good it could probably turn Bugs Bunny into a boozer! DIRECTIONS: Mix the teaspoon of spiced honey with the cream cheese. Put the cream cheese mixture in a small sandwich baggie, squeeze the cream cheese to the corner, clip a very small hole in the corner then pipe this on the rim. Dip into your crushed walnuts then chill the glass in the freezer. Add the water to the remaining spiced honey in a small microwave container and nuke for about 20 seconds, set aside to cool. Fill the cocktail shaker with ice, add the cooled spiced honey creme, transfer the drink from the blender and shake until the cocktail shaker frosts over. Strain into your glass, top off with club soda, tap the bitters on top, add a straw and swizzle stick, garnish and serve. Yes, the spicy, sweet cream cheese and walnut rim is mostly for show, but it's really good - like a sweet cheese ball rolled in nuts - and you'll find that people will probably stick a finger in it and lick it off while they drink the cocktail.